MariaDB audit tool by DataSunrise ensures full real-time visibility of database transactions and user activity. With auditing enabled every database operation is tracked and kept record of. This way the administrator knows what database records were impacted, who performed the operation and when. The gathered information is then used for analysis. 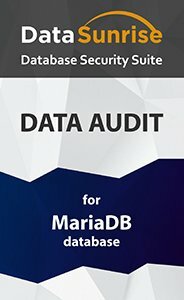 MariaDB audit tool by DataSunrise is trustworthy software designed to analyze database traffic and collect information about all incoming queries and results of their execution. Data Audit performs real-time activity tracking of all user actions and changes made to a database. It has a sophisticated self-learning system which divides SQL queries into suspicious and typical ones according to intellectual analysis of given database activity, which helps to pay closer attention to potentially dangerous activities. Data Audit has a user-friendly interface that simplifies working with the system. More detailed information on monitoring feature is available here. In some cases companies don’t even realize that their data has been stolen. Especially when the attack has been performed by employees of the company, who have legal access to sensitive information. With Data Audit by DataSunrise you always know who, when made a certain query to the database and what was the result of the query. It allows to detect data leaks and investigate them. Moreover, it is a powerful tool to prevent such incidents before they take place by revealing non-typical queries from privileged users or attempts to acquire data they are not allowed to view. Number of database entries, database instance that received user queries. There is an opportunity to export audit results to any external SIEM-systems for further inspection or store it in an external database. Analysis of log files helps to reveal potential vulnerabilities that can be exploited by attackers to get the access to sensitive data. High technology era dictates its own terms and reminds us not to underestimate the importance of information security measures. DataSunrise Data Audit for MariaDB will become another reliable defense shield in your security system.